Wednesday in the journal Nature. The findings were also announced at a news conference at NASA Headquarters in Washington. and being all temperate, meaning they could have water on their surfaces and potentially support life. and astronomer at the University of Liège in Belgium. 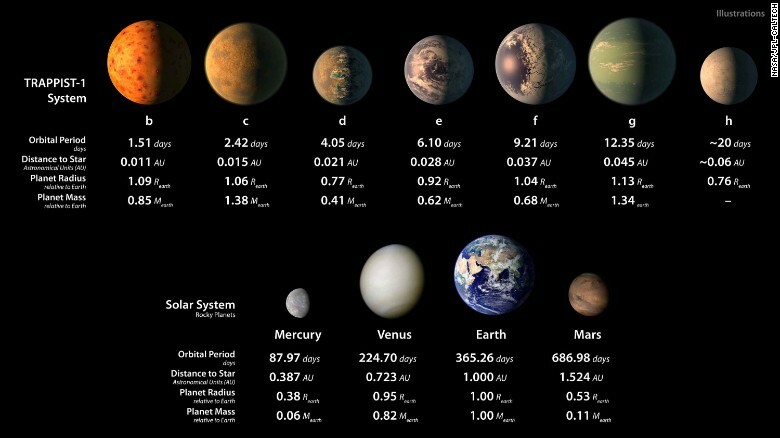 star, known as TRAPPIST-1e, f and g, and may even have oceans on the surface. could be suitable with the right atmosphere and enough greenhouse gases. [+4] - rosborne979 - 02/22/2017I think it's important to know this stuff, even if we can't actually set foot on the planet. [+3] - rosborne979 - 02/22/2017Cool. Has it been confirmed (within a reasonable doubt)? I remember another report of something around Proxima which turned out to be an error. [+3] - farmerman - 02/23/2017Ill need some good boots. I hope we have a place so I can charge all my lab gizmos. SHOTGUN!! planetary systems other than our own. Cool. Has it been confirmed (within a reasonable doubt)? I remember another report of something around Proxima which turned out to be an error. I wonder if their proximity to each other causes tides on neighboring planets. And I bet that first one will end up being more like Venus than Earth. Still, it's neat. I truly think we will find bacterial/viral/microscopic life in my lifetime. Now they've gotta figure out how to resolve the atmospheres sufficiently to get some idea of their composition. I wonder if then new James Webb Telescope (when launched) will be able to resolve the atmospheres. One of the main uses of the James Webb Space Telescope will be to study the atmospheres of exoplanets, to search for the building blocks of life elsewhere in the universe. But JWST is an infrared telescope. How is this good for studying exoplanets? 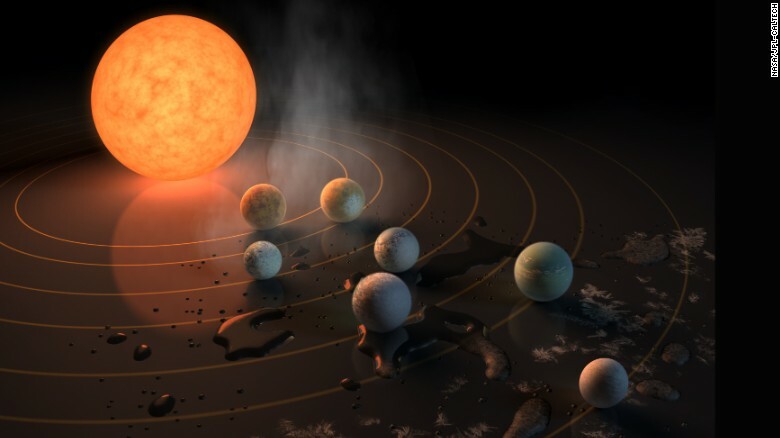 One method JWST will use for studying exoplanets is the transit method, which means it will look for dimming of the light from a star as its planet passes between us and the star. (Astronomers call this a "transit".) Collaboration with ground-based telescopes can help us measure the mass of the planets, via the radial velocity technique (i.e., measuring the stellar wobble produced by the gravitational tug of a planet), and then JWST will do spectroscopy of the planet's atmosphere. JWST will also carry coronagraphs to enable direct imaging of exoplanets near bright stars. The image of an exoplanet would just be a spot, not a grand panorama, but by studying that spot, we can learn a great deal about it. That includes its color, differences between winter and summer, vegetation, rotation, weather...How is this done? The answer again is spectroscopy. Forty light years away. That's forty years covering the distance that light travels. Space travel is too slow, unless we find out that space has short cuts built into it. The only good this awareness does is it changes the thinking that was prevalent only a cenury ago, that we must be the only living things in the universe. Why is that good? I could be wrong; it might not be? It might just make searching for one's soul mate that much more difficult. I think it's important to know this stuff, even if we can't actually set foot on the planet. It's very important economically for the USA. The whole world loves Hollywood movies, especially big sci-fi epics with lots of special effects. With seven planets to play with, imagine the box office, video sales and product tie-ins when the films hit the screen in a couple of years. Probably a whole bunch of guys on the phone working out production deals right now. Voted you up Dale. I want to encourage you to post on threads like this. a whole generation involved in what?? lerning the internals of an atom? To hat purpo was thi initial work carried on. MArie Sklodoqwska and her husband? Lord Rutherord? . Somewhere in the arch of time, those first workers provided a tapestry of ideas that led to a question "What would happen if we closely packed these various isotopes together"? could they wring out some energy, An what happens to an isotope if we first bombard it with a spare neutron. I think we see space as a "frontier" that can yield things we dont yet understand. On thing so know is that the earth's lifes[an is not infinite and maybe space travel will provide our species some cover from final annihilation. Ill need some good boots. I hope we have a place so I can charge all my lab gizmos.